As hard as it was to leave the emerald waters of Boya Lake, we were excited to connect up with the Alaska Highway and cross into the Yukon Territory today. 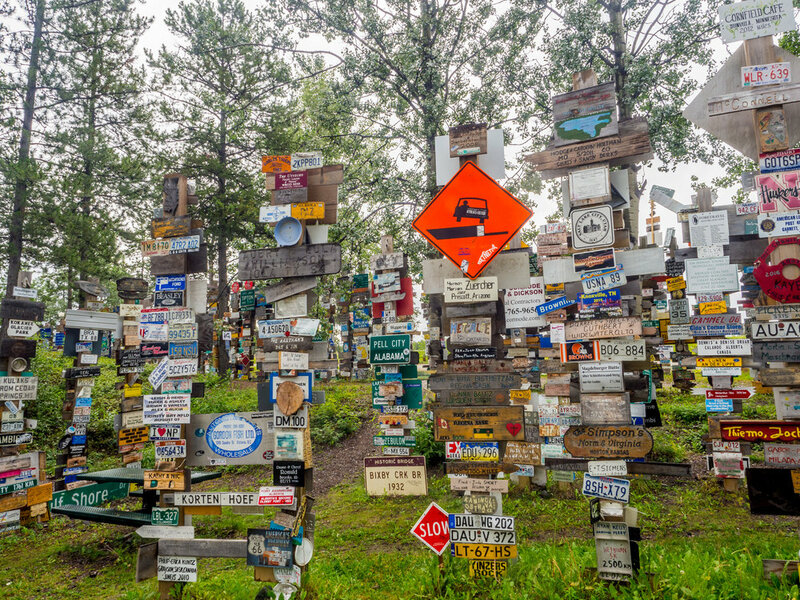 We intersected with the famous highway just outside of Watson Lake so we decided to go into town to see the very touristy (but kind of impressive) signpost forest. 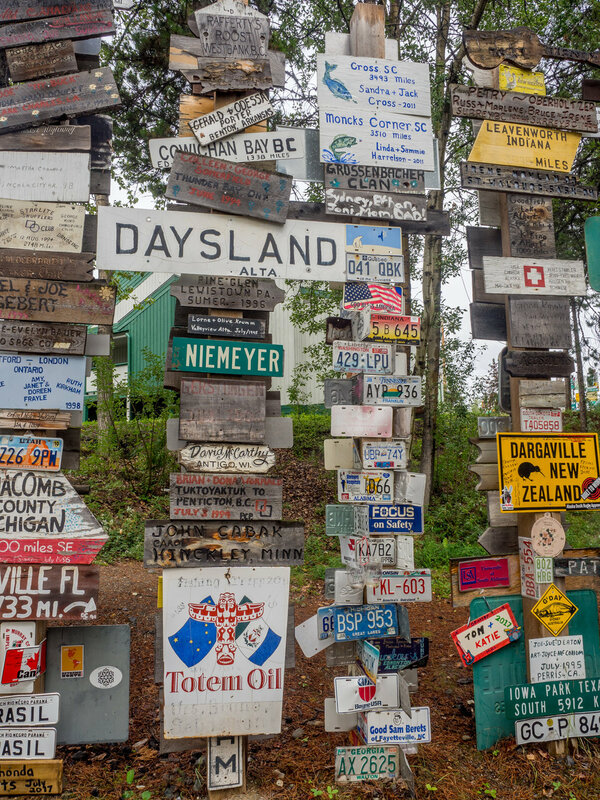 Started in 1942 by a homesick GI who erected a sign to his home town of Danville, IL showing that it was 2835 miles from there, people have been adding their own signs ever since. I don't remember the exact number but I think there are now almost 70,000 signs there from all over the world. The forest encompasses several acres of land along the highway. The drive west toward Whitehorse, YT was pretty with more traffic than we had encountered on the Cassiar. We crossed the Yukon River and went through First Nations land where we learned more about their culture from roadside signs. We spent the night in Whitehorse - which is a surprisingly large city with all the city-like amenities - and took advantage of laundry and oil change opportunities. 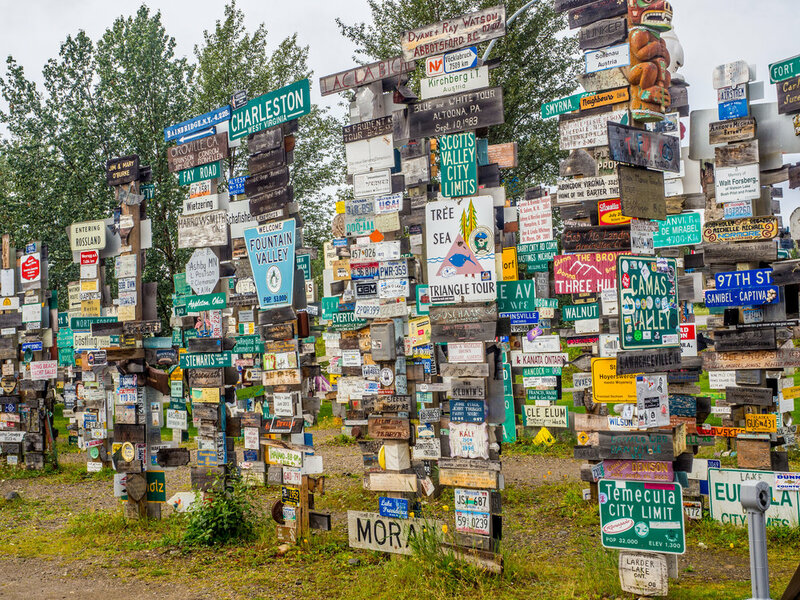 The big decision at this point was whether to go north from here to the center of the Klondike gold rush (Dawson City) or continue on the Alaska Highway toward Alaska. 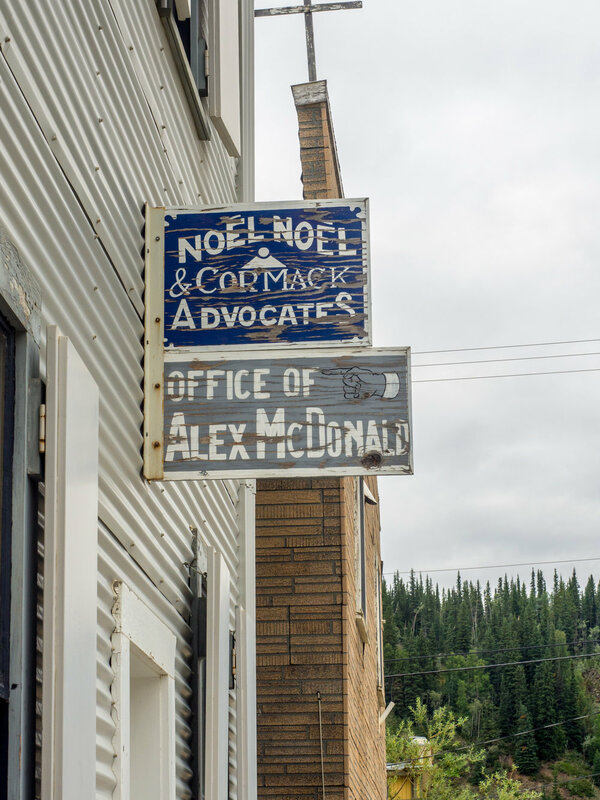 I knew that Jeff would love Dawson City's history but going that way meant that I would have to drive the "Top of the World" highway to get to Alaska and I wasn't sure I was up for that based on things I had heard. In the end, because it was Jeff's birthday, I let him make the decision so it was off to Dawson City. Dawson City turned out to be the right decision and ended up being Jeff's favorite part of the trip. 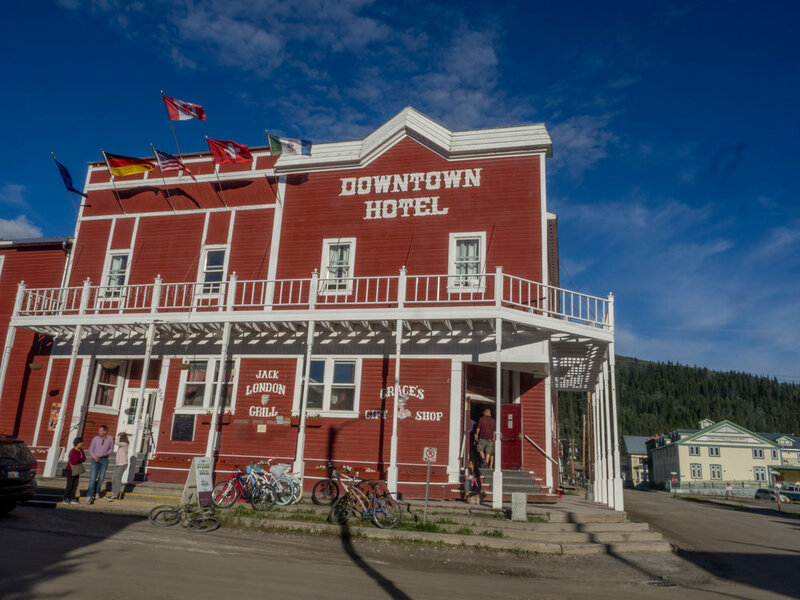 This once boom town capital turned ghost town turned tourist town has a fascinating history. 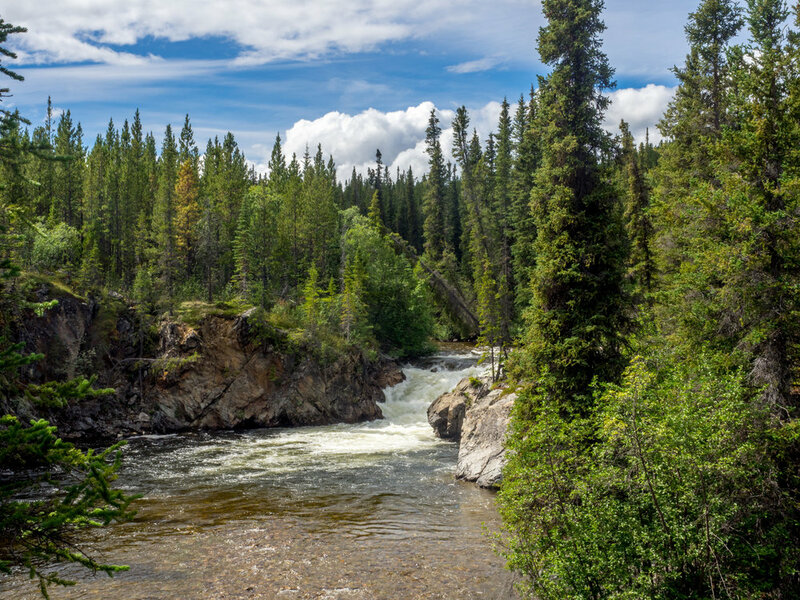 When gold was discovered in the area in 1897, as many as 40,000 people made the trip up to the Yukon to stake their claim. But just a short 2 years later, the stampede had moved on to the Nome, Alaska area and the population of Dawson plummeted to just 8,000. There was still enough prosperity in the area to attract a cultured and wealthy group and the city became known as "The Paris of the North" for its high-end shops offering anything you could find in a less remote, big city elsewhere. In fact, Dawson City got electricity and other modern amenities before many other cities. It remained the capital of the Yukon territory until it was moved to Whitehorse in 1953 due to the construction of the Alaska Highway. By 1906, most gold mining had stopped and the town lost most of its residents. Today there is a year round population of about 500. 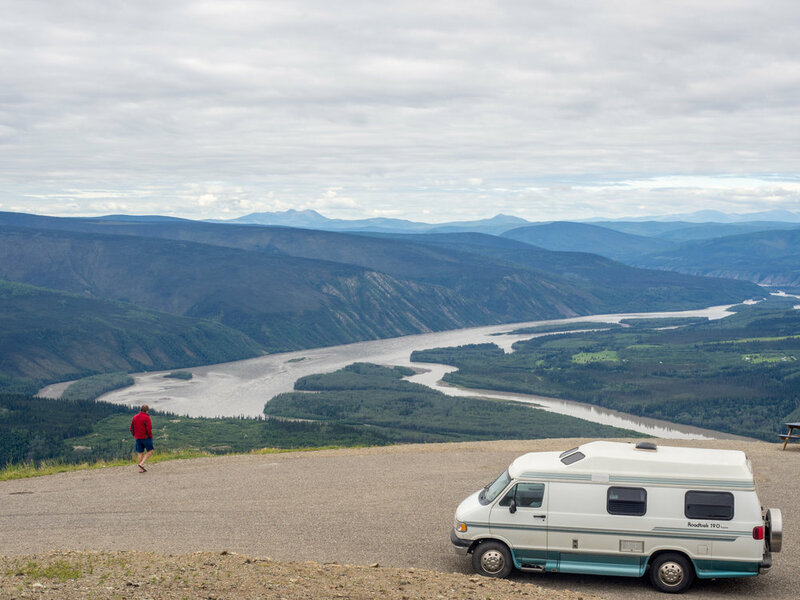 We spent the night in a riverside campground across the Yukon River from Dawson and, since there is no bridge, had to take a short, free, ferry to get there. We drove up what is called the Dome Road to get a beautiful aerial view of the city and the river. When we were gassing up back in town, we met a couple who are from Racine and were heading toward home after being on the road for 6 months. The woman was a 1974 graduate of my high school and lived next door to my best friend in childhood - another example of how small the world really is! On to the Top of the World Highway and Chicken, Alaska!